In this research, the evaluations made for the Turkish Airlines on TripAdvisor web site in the first 4 months of 2017 were examined and the issues that passengers were satisfied and not satisfied were determined. The data were collected in January and February 2018. As a result of the data collection process, 647 available data were acquired. According to the results of the Mann Whitney U analysis, it was determined that the gender of the passengers who gave scores to services of Turkish Airlines had a significant difference on the general scores given to Turkish Airlines, customer services, in-flight entertainment and the value of the money paid. According to the results of Kruskall Wallis H analysis, it was seen that the services of Turkish Airlines and Russia and Ukraine have the highest satisfaction in all of the services offered by Turkish Airlines. Looking at the nations with the lowest satisfaction, the United Kingdom and Central Asia and Far East passengers were determined. Bu araştırmada 2017 yılının ilk 4 ayında TripAdvisor web sitesinde Türk Hava Yolları için yapılan değerlendirmeler incelenerek yolcuların memnun oldukları ve olmadıkları hususlar belirlenmeye çalışılmıştır. Veriler 2018 yılı Ocak ve Şubat ayları içerisinde toplanmıştır. Veri toplama süreci sonucunda 647 adet kullanılabilir veri elde edilmiştir. Yapılan Mann Whitney U analizi sonuçlarına göre Türk Hava Yolları’nın sunduğu hizmetlere puan veren yolcuların cinsiyetinin, Türk Hava Yolları’na verilen genel puan, müşteri hizmetleri, uçak içi eğlence ve ödenen paranın değerine verilen puanlar üzerinde anlamlı bir fark yarattığı belirlenmiştir. Yapılan Kruskall Wallis H analizi sonuçlarına göre ise Türk Hava Yolları’nın sunmuş olduğu hizmetlerin tamamında Rusya ve Ukrayna vatandaşlarının en yüksek memnuniyete sahip oldukları görülmüştür. En düşük memnuniyete sahip olan milletlere bakıldığında Birleşik Krallık ile Orta Asya ve Uzak Doğu yolcularının olduğu tespit edilmiştir. Aksoy, Ş., Atılgan, E. ve Akıncı, S. (2003). Airline Services Marketing by Domestic and Foreign Firms: Differences from the Customers’ Viewpoint, Journal of Air Transport Management, 9, 343-351. Aydın, K. ve Yıldırım, S. (2012). The Measurement of Service Quality with SERVQUAL for Different Domestic Airline Firms in Turkey, Serbian Journal of Management, 7(2), 219-230. Banerjee, S. ve Chua, A. Y. K. (2016). In Search of Patterns Among Travellers' Hotel Ratings in Tripadvisor, Tourism Management, 53, 125-131. Başfırıncı, Ç. ve Mitra, A. (2015). A Cross Cultural Investigation of Airlines Service Quality through Integration of Servqual and the Kano Model, Journal of Air Transport Management, 42, 239-248. Bayram, M. (2017). Tüketicilerin İstanbul Restoranlarına Yönelik Algıları: Memnuniyetlerini Etkileyen Unsurların Değerlendirilmesi, Journal of Tourism and Gastronomy Studies, 5(4), 142-154. Bertan, S. (2016). Michelin Yıldızlı Restoran İşletmelerinin Değerlendirilmesi, Journal of Human Sciences, 13(2), 3221-3230. Book L. A., Tanford, S., Montgomery, R. ve Love, C. (2018). 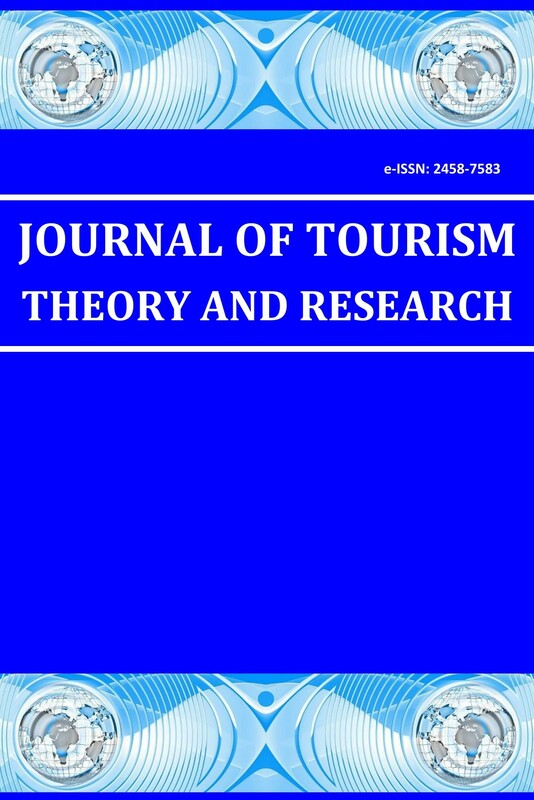 Online Traveler Reviews as Social Influence: Price is no Longer King, Journal of Hospitality & Tourism Research, 42(3), 445–475. Browning, V., Fung, So K. K., Sparks, B. (2013). The Influence of Online Reviews on Consumers’ Attributions of Service Quality and Control for Service Standards in Hotels, Journal of Travel and Tourism Marketing, 30(1-2), 23-40. Cezar, A. ve Öğüt, H. (2016). Analyzing Conversion Rates in Online Hotel Booking: The Role of Customer Reviews, Recommendations and Rank Order in Search Listings, International Journal of Contemporary Hospitality Management, 28(2), 286-304. Chen, I. S. (2016). A Combined MCDM Model Based on DEMATEL and ANP for the Selection of Airline Service Quality Improvement Criteria: A Study Based on the Taiwanese Airline Industry, Journal of Air Transport Management, 57, 7-18. Cheng, Y. H. ve Ho, H. Y. (2015). Social Influence's Impact on Reader Perceptions of Online Reviews, Journal of Business Research, 68(4), 883-887. Chou, C. C., Liu, L.J., Huang, S. F., Yin, J. M. ve Han, T. Z. (2011). An Evaluation of Airline Service Quality Using the Fuzzy Weighted SERVQUAL Method, Applied Soft Computing, 11, 2117-2128. Dalgıç, A., Güler, O. ve Birdir, K. (2016). Tripadvisor.com’da Yer Alan Restoran Şikâyetlerinin Analizi: Mersin ve Hatay’da Yöresel Yiyecek Sunan Restoranlara Yönelik Bir Araştırma, Journal of Tourism and Gastronomy Studies, 4(1), 153-173. Doğan, S. (2017). Otellere Yönelik Yapılan Puanlama ve Çevrimiçi Yorumların Değerlendirilmesine İlişkin Aksaray İlinde Bir Araştırma, Aksaray Üniversitesi İktisadi ve İdari Bilimler Fakültesi Dergisi, 9(3), 27-36. Doğan, S., Yücel Güngör, M. ve Tanrısevdi, A. (2016). Çevrimiçi Tüketici Yorumlarının İçerik Analizi Yoluyla İncelenmesi: Kuşadası’ndaki Yiyecek Ve İçecek İşletmeleri Üzerinde Bir Araştırma, Uluslararası Hakemli Pazarlama ve Pazar Araştırmaları Dergisi, 9, 1-22. Du, C., Ejem, E. ve Ezenwa, A. (2012). Evaluation of Service Quality of Nigerian Airline Using Servqual Model, Journal of Hospitality Management and Tourism, 3(6), 117-125. Erdem, Ö. ve Yay, Ö. (2017). Tripadvisor’daki Müşteri Şikâyetlerinin Değerlendirilmesi: Antalya Örneği, Journal of Tourism and Gastronomy Studies, 5(4), 227-249. Eren, R. ve Çelik, M. (2017). Çevrimiçi Gastronomi İmajı: Türkiye Restoranlarının Tripadvisor Yorumlarının İçerik Analizi, Turizm Akademik Dergisi, 4(2), 121-138. Farooq, M. S., Salam, M., Fayolle, A. ve Jaafar, N. (2018). Impact of Service Quality on Customer Satisfaction in Malaysia Airlines: APLS-SEM Approach, Journal of Air Transport Management, 67, 169-180. Gülertekin Genç, S., Genç, V. ve Gümüş, M. (2016). Otel İşletmelerinde Duygusal Zekanın İş Stresi ve İş Yaşam Dengesi Üzerindeki Etkisi, Batman Üniversitesi Yaşam Bilimleri Dergisi, 6(2/1), 97-112. Haşıloğlu, S. B., Baran, T. ve Aydın, O. (2015). Pazarlama Araştırmalarındaki Potansiyel Problemlere Yönelik Bir Araştırma: Kolayda Örnekleme ve Sıklık İfadeli Ölçek Maddeleri, Pamukkale İşletme ve Bilişim Yönetimi Dergisi, 2(1), 19-28. Hu, Y. H. ve Chen, K. (2016). Predicting Hotel Review Helpfulness: The Impact of Review Visibility, and Interaction Between Hotel Stars and Review Ratings, International Journal of Information Management, 36(6), 929-944. Huang, Y. K. (2009). The Effect of Airline Service Quality on Passengers’ Behavioural Intentions Using SERVQUAL Scores: A TAIWAN Case Study, Journal of the Eastern Asia Society for Transportation Studies, 8, 2330-2343. Hussain, R., Al Nasser, A. ve Hussain, Y. K. (2015). Service Quality and Customer Satisfaction of a UAE-Based Airline: An Empirical Investigation, Journal of Air Transport Management, 42, 167-175. İbiş, S. ve Batman, O. (2016). Havayolu İşletmelerine Yönelik Yapılan Müşteri Şikayetlerinin Analizi, 3rd International Congress of Tourism & Management Researches, Mersin Üniversitesi, Mersin. Kağnıcoğlu, C. H. ve Özdemir, E. (2016). Hizmet Sektöründe Hizmet Kalitesi Algısı: Havayolu Check-In Hizmetlerinde Bir Uygulama, Journal of Management, Marketing and Logistics, 3(2), 156-162. Kim, W. G., Li, J. ve Brymer, R. A. (2016). The Impact of Social Media Reviews on Restaurant Performance: The Moderating Role of Excellence Certificate, International Journal of Hospitality Management, 55, 41-51. Kos Koklic, M., Kukar-Kinney, M. ve Vegelj, S. (2017). An Investigation of Customer Satisfaction with Low-Cost and Full-Service Airline Companies, Journal of Business Research, 80, 188-196. Jeeradist, T., Thawesaengskulthai, N. ve Sangsuwan, T. (2016). Using TRIZ to Enhance Passengers' Perceptions of an Airline's Image through Service Quality and Safety, Journal of Air Transport Management, 53, 131-139. Min, H., Lim, Y. ve Magnini, V. P. (2014). Factors Affecting Customer Satisfaction in Responses to Negative Online Hotel Reviews, Cornell Hospitality Quarterly, 56(2), 223-231. Nadiri, H., Hussain, K., Ekiz, E. H. ve Erdoğan, Ş. (2008). An Investigation on the Factors Influencing Passengers’ Loyalty in the North Cyprus National Airline, The TQM Journal, 20, 265-280. Namukasa, J. (2013). The Influence of Airline Service Quality On Passenger Satisfaction and Loyalty: The Case of Uganda Airline Industry, The TQM Journal, 25(5), 520-532. Neirotti, P., Raguseo, E. ve Paolucci, E. (2016). Are Customers’ Reviews Creating Value in The Hospitality Industry? Exploring the Moderating Effects of Market Positioning, International Journal of Information Management, 36, 1133-1143. Ng, S. I., Sambasivan, M. ve Zubaidah, S. (2011). Antecedents and Outcomes of Flight Attendants’ Job Satisfaction, Journal of Air Transport Management, 17, 309-313. Pakdil, F. ve Aydın, Ö. (2007). Expectations and Perceptions in Airline Services: An Analysis Using Weighted SERVQUAL Scores, Journal of Air Transport Management, 13, 229-237. Park, J. W., Robertson, R. ve Wu, C. L. (2004). The Effect of airline Service Quality on Passengers’ Behavioural Intentions: a Korean Case Study, Journal of Air Transport Management, 10, 435–439. Park, S. ve Nicolau, J. L. (2015). Asymmetric Effects of Online Consumer Reviews, Annals of Tourism Research, 50, 67-83. Perçin, S. (2018). Evaluating Airline Service Quality Using a Combined Fuzzy Decision-Making Approach, Journal of Air Transport Management, 68, 48-60. Raguseo, E., Neirotti, P. ve Paolucci, E. (2017). How Small Hotels can Drive Value their Way in Infomediation: The Case of ‘Italian Hotels vs. OTAs and TripAdvisor’, Information & Management, 54(6), 745-756. Rajaguru, R. (2016). Role of Value For Money and Service Quality on Behavioural Intention: A Study of Full Service and Low Cost Airlines, Journal of Air Transport Management, 53, 114-122. Sparks, B. A., Fung-So, K. K. ve Bradley, G. L. (2016). Responding to Negative Online Reviews: The Effects of Hotel Responses on Customer Inferences of Trust and Concern, Tourism Management, 53, 74-85. Suki, N. M. (2014). Passenger Satisfaction with Airline Service Quality in Malaysia: A Structural Equation Modeling Approach, Research in Transportation Business & Management, 10, 26-32. Taştan, H. ve Kızılcık, O. (2017). Kahramanmaraş’ta Bulunan Yiyecek İçecek İşletmelerine Yönelik Tripadvisor.Com’da Paylaşılan Şikâyetlerin Sınıflandırılması, Çukurova Üniversitesi Sosyal Bilimler Enstitüsü Dergisi, 26(1), 270-284. TripAdvisor. (2018). TripAdvisor Hakkında, URL: https://tripadvisor.mediaroom.com/tr-about-us, Erişim Tarihi: 02.09.2018. Tsafarakis, S., Kokotas, T. ve Pantouvakis, A. (2018). A Multiple Criteria Approach for Airline Passenger Satisfaction Measurement and Service Quality Improvement, Journal of Air Transport Management, 68, 61-75. Wu, H. C. ve Cheng, C. C. (2013). A Hierarchical Model of Service Quality in the Airline Industry, Journal of Hospitality and Tourism Management, 20, 13-22. Xie, K. L., Fung-So, K. K. ve Wang, W. (2017). Joint Effects of Management Responses and Online Reviews on Hotel Financial Performance: A Data-Analytics Approach, International Journal of Hospitality Management, 62, 101-110. Yıldırım A. ve Şimşek H. (2016). Sosyal Bilimlerde Nitel Araştırma Yöntemleri, 10. Baskı, Ankara: Seçkin Yayıncılık. Zhu, D. H., Zhang, Z. J., Chang, Y. P. ve Liang, S. (2018). Good Discounts Earn Good Reviews in Return? Effects of Price Promotion on Online Restaurant Reviews, International Journal of Hospitality Management, doi.org/10.1016/j.ijhm.2018.06.028.